This unit is suitable for drag race. There are different wheel drive ways for different vehicles, such as front 2WD, rear 2WD, and 4WD; the coilover will be different, of course. 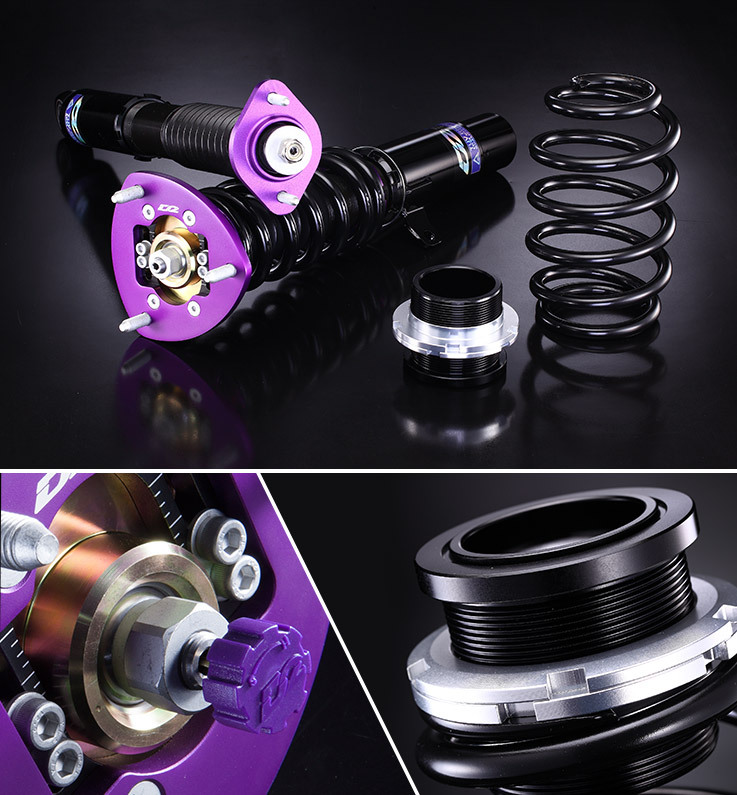 The most important function for ride height adjustable is avoided to compress the spring by the spring seat caused the unusual sound when you change the ride height or lower the vehicle too much caused the spring seat does not snug the spring, that will damage the coilover. The ride height can be dropped 60~100mm from OE ride height for your reference. Made up of aluminum material to reduce the weight of vehicle. We advise our customers who utilize the principle of ride height adjustable when installation to balance the weight of driving tires to avoid the time so long that make the tire to idle running to increase LSD (Limited Slip Differential) life-cycle. The function is when start of a race in the twinkling of an eye, front and rear weight will change according to the driving wheels and the driving wheels will be compressed more to reduce the time of idle running of tires and increase the stability of vehicle in high speed. 3D pillowball upper mount for your options can be adjusted the camber and caster. DRAG suspension kit is made specifically for your personal use so both front and rear struts are marked as "★"
The pillowball top mount can be adjusted the camber degrees and increase the handling and stability of your vehicle by 10%. However, it is easy to creating some slight unusual sound when come across a big bumps. The pillowball top mount covers no warranty.